Starz, a Lionsgate company, today released the official trailer for the second season of the epic series American Gods, premiering on Sunday, March 10th, 2019 at 8PM ET/PT on STARZ. At almost two full minutes in length, the trailer offers faithful worshipers an extended look at new footage from the upcoming season of the series which is based on Neil Gaiman's international best-selling novel. So much more has been revealed than we saw in the initial NYCC teaser trailer which was released in October. 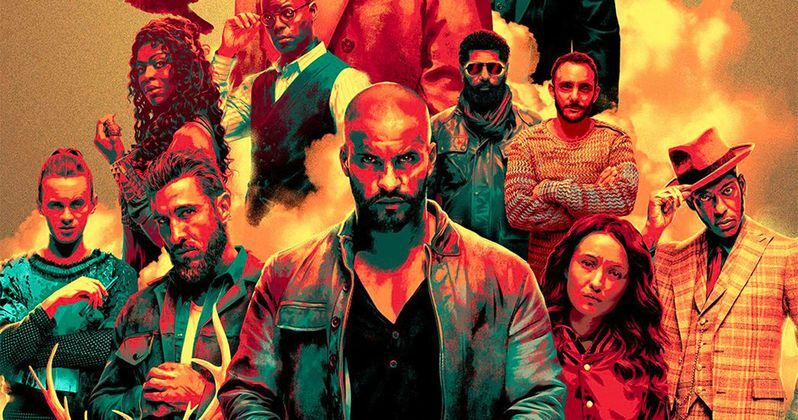 Starring Ricky Whittle (The 100, Nappily Ever After) as Shadow Moon and Ian McShane (Deadwood, John Wick) as Mr. Wednesday, American Gods is a one-hour drama adapted from Neil Gaiman's best-selling novel about a war brewing between Old Gods and New Gods: the traditional gods of mythological roots from around the world steadily losing believers to an upstart pantheon of gods reflecting society's modern love of money, technology, media, celebrity and drugs. We were forged in God's image, but the Gods are also made in ours - and in Season Two the battle moves inexorably toward crisis point as the destinies of gods and men collide. While Mr. World plots revenge for the attack against him in Season One, Shadow throws in his lot with Wednesday's attempt to convince the Old Gods of the case for full-out war, with Laura and Mad Sweeney in tow. A council at the House on the Rock explodes into chaos, sending deities both Old and New on quests across America that will converge on Cairo, Illinois forcing Shadow to carve out a place as a believer in this strange new world of living gods - a dark world where change demands commitment, and faith requires terrible sacrifice. American Gods also stars Emily Browning (Sucker Punch, The Affair) as Laura Moon, Pablo Schreiber (First Man, Orange is the New Black) as Mad Sweeney, Crispin Glover (Back to the Future, Alice In Wonderland) as Mr. World, Orlando Jones (Madiba, Sleepy Hollow) as Mr. Nancy, Yetide Badaki (Aquarius, This Is Us) as Bilquis, Bruce Langley (Deadly Waters) as Tech Boy, Mousa Kraish (Superbad, Transparent) as The Jinn, Omid Abtahi (Damien, Legends) as Salim and Demore Barnes (12 Monkeys, Waco) as Mr. Ibis. Guest stars include Cloris Leachman (Malcom in The Middle, Raising Hope) as Zorya Vechernyaya, Peter Stormare (Fargo, Prison Break) as Czernobog, and joining Season Two are Sakina Jaffrey (House of Cards, The Blacklist) as Mama-Ji', Dean Winters (Divorce, Law & Order: Special Victims Unit) as Mr. Town, Devery Jacobs (Cardinal, The Order) as Sam Black Crow and Kahyun Kim (Adam Ruins Everything and Shameless) as New Media. American Gods is produced by Fremantle. Jesse Alexander, Neil Gaiman, Craig Cegielski, Scott Hornbacher, Ian McShane, Stefanie Berk, Christopher J. Byrne and Padraic McKinley serve as executive producers.